The worlds first puzzle book designed for people with dementia. A puzzle may be more than just a way to pass the time and entertain you.Research has shown that keeping the brain actively stimulated helps to guard against dementia, but what if you have the disease already? Hope is not lost, even if you have dementia it is helpful to still stimulate and challenge your brain. 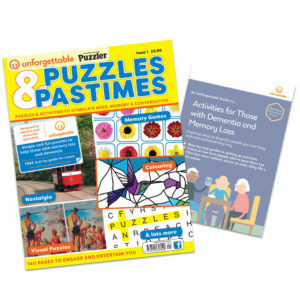 Unforgettable the online retailer of all things dementia-related have created the world’s first puzzle book for people with the disease. James Ashwell who is the founder of Unforgettable has not jumped on the dementia “bandwagon”, he has pulled on the very personal experience of caring for his Mum who had the early onset type of the disease. 140 pages of memory games, nostalgia, crosswords, visual puzzles and much more. Designed by Unforgettable, with feedback from our community and in partnership with Puzzler, one of the UK’s oldest puzzle specialists. The games are carefully designed to engage, stimulate and occupy people living with dementia and their carers. It includes a broad range of activities at 3 different levels of challenge, so whether you’re after a full and fun mental workout, or some straightforward games to dip in and out of, there’s something for you. Themes include nature, transport, sport, seaside memories with images carefully chosen to inspire heartwarming memories for anyone who uses it. Why buy Puzzles & Pastimes today? Whilst the price end is a little high at £5.99 and people challenging this, one idea is maybe to photocopy some of the puzzles for added value. This is such a great idea! Continuing to challenge and stretch the brain is such an important part of growing older, especially if it can help with such a debilitating disease. Thanks for this!